What an absolutely fantastic idea! Thank you so much for making Leabank Square look pretty again. We were one of the first families to move into Leabank and sadly it has gone down hill since the first 5-10 years. 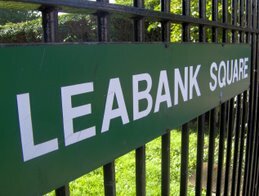 Thankfully though, with all the children getting involved and taking interested in how Leabank looks, we are now starting to have a beautiful Square to be proud if again! No worries! I must say that it is SOOOOO good for the soul to see the next generation of Leabankers getting so stuck in!! Let's hope that most of them carry this spirit on into their teens - and still continue making Leabank Square beautiful for everyone!! Thanks for your words of encouragement - this is what drives all of us onwards! Yeah - I've ALSO noticed how many more water birds have started perching along the Lea Bank too. This morning I saw a cormarant drying it's wings on our (very beautiful) Bank for about 15 minutes!! Not only that - but because of all the flowers - we are starting to attract butterflies & bees!! Just like a real country garden should!! Thanks to all you guys - it is really starting to make a HUGE difference to ALL our lives!